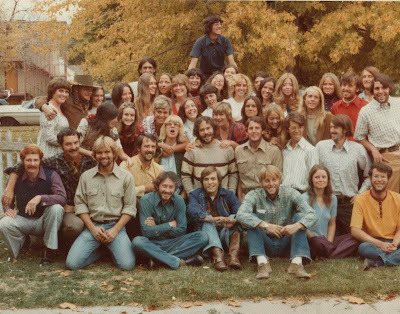 When I was 20 I packed an army blanket, a pocket knife, my toothbrush, a couple of books, a journal, a primitive camera and a few changes of socks and underwear and headed for the desert of southern Utah with this motley group of strangers. This experience was affectionately known as Survival, but on my BYU transcript it somewhat sterily comes up at Youth Leadership 480. A bus dropped us off in the general vicinity of Green River, UT, and picked us up in Escalante, UT, exactly 30 days later. We filled that month with walking, starving, climbing, walking, bonding, huddling around campfires, hiking, orienteering, losing one another, finding one another, eating cactus and wild berries, talking ad nauseum about food, and generally having the time of our young lives. A few of us started the trip with drug addictions, a few of us were on the trip to escape troubles, and at least one of us joined the Church and took up a whole new lifepath as a result. We read a lot of books, discussed even more, and at the end of the trip we spent 3 days entirely alone figuring it all out. We cooked a couple of snakes and learned amazing culinary variations using only flour, salt, a little cheese, and rosehips if we could scrounge them out. We held Church services and passed around a canteen and some nuts we found rollling around on the ground for sacramental purposes We drank some pretty rank water out of the Dirty Devil River--after we'd rung it out of our bandanas. But most of the time we just walked. Lots of walking. They estimated we covered over 500 miles in that month. The amazing part of this story is that I carry this experience so deeply in me that it rarely surfaces in conversation--yet it has colored the very lenses through which I view life daily. Go figure. This picture shows us at the gathering we held at the "Cookie Jar"--my place of residence for 2 years--a day or so after we returned. We've cleaned up obviously. Notice that all the girls pretty much insisted on wearing dresses. What I wouldn't give to wrap my arms around just one of these necks...and drop back for awhile. Where are you all? Oh in case you haven't found me--I'm the head on the back row under the right arm of Don perched above the group looking off into the distance. I think I'll go dig out my journal and post some stuff out of it. Do you mind? Wow! You haven't aged a day! So excited to read about some of your adventures. You look the same! What an amazing experience that must have been. You are braver than me. I'm waiting on the edge of my seat as well. That's amazing you did that. I don't think I could even imagine myself there. It's amazing you guys didn't perish. I too would like to hear more. You are an amazing woman. How fun to see this picture, Tag, after all of these years! Of course, I first went to see where I was -- second row just to the left of the two other guys I mentioned, Kent Potter, and Roger. Happy Birthday!! Thanks for 20 Great Years!